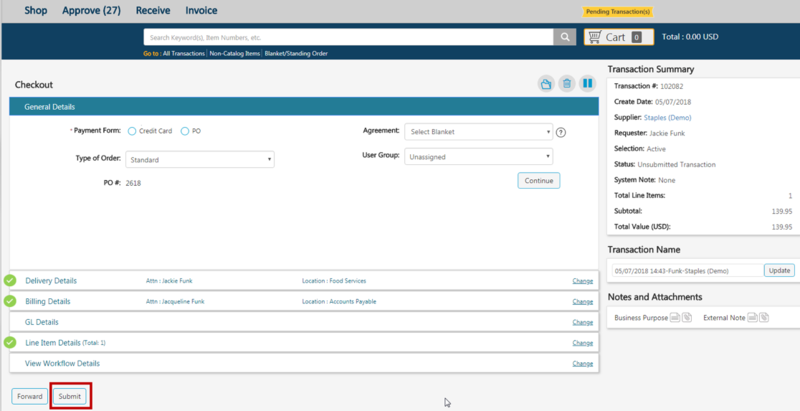 Standing Order functionality allows for tracking of invoices against a supplier agreement or contract. Once a standing order has reached its expiration date, or its value has been exhausted, no additional invoices can be created against it. Notifications can be configured to alert users once a standing order is within a specified timeframe for expiration, or once total payments against the standing order reaches a specified dollar or percentage limit. A standing order will encumber funds up front during the creation process using the specified account codes. The new user interface must be enabled to use Standing Order, and not all General Ledger / Fund Accounting systems currently support it. Please contact Customer Support if you would like additional information. The Invoice Due Date will continue to default based on the Invoice Date and Payment Terms, but it can be edited if necessary. The logic used to calculate an invoice match (success or failure) will now consider all invoices created against the specific Purchase Order. Previously, only the active invoice was considered during the match calculation. In Edit Entity Settings, a new setting has been added to mark an invoice as closed after it successfully transmits to a GL/ERP system. The new setting, Automatically Close Invoice, will default to No. The Invoice tab will no longer display any submenu options. When the tab is accessed, all existing invoices will display in a summary list. The search at the top of the screen allows the user to search by transaction, purchase order, invoice or standing order. If creating a manual invoice and both match types are enabled, a prompt will display to determine whether a header or line item match will be performed. A link will display to the right of the search to facilitate no match invoices for purchases that did not originate in ESM Purchase. If an invoice fails a header or a line match and a user selects the option to Override, the match status will display as a hyperlink. When clicked, a popup will display indicating the date and time of the override selection, as well as the user who performed the action. This data will also be available for reporting. 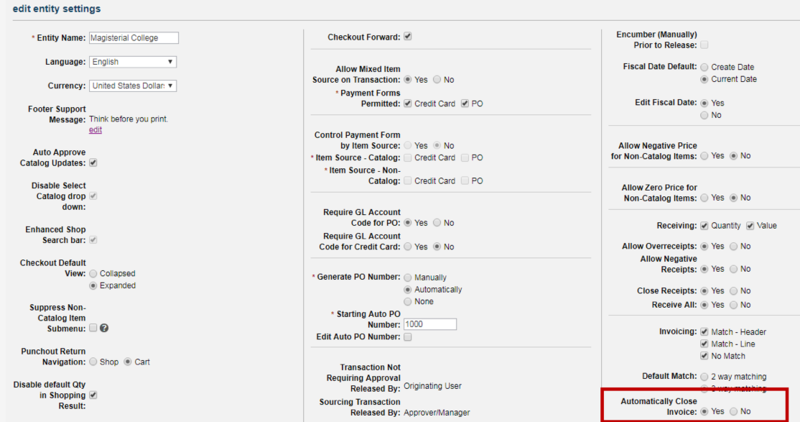 When accessing a transaction from the Checkout view, the default action button will display as Submit if a bypass or workflow has not been calculated. Clicking the Submit button will determine whether a bypass or workflow applies to a transaction. If a bypass is found, the Release PO or Prepare CC Order button will display. If a workflow is found, the transaction will be sent to the GL/ERP (if applicable) and then routed to the Approve tab. Six new auxiliary fields have been added to the Workbench Page Configuration screen. Like the existing auxiliary fields, the new fields can be configured as required, established as text entry or drop-downs, displayed on Purchase Orders and included in workflows. In an upcoming release this summer, these fields can be added to the Checkout page. At this time, the fields will not be visible in any pages aside from Workbench Page Configuration. Customers will be updated once these fields are fully functional. This enhancement will be available for the new user interface only. Please contact Customer Support if you have any questions. A Retract Award option has been added to the Next Step drop-down in the Award tab. This option will be active if an award has been published to suppliers. When selected, a popup confirmation will display to allow the user to determine if the suppliers will be notified of the retraction. After an award has been retracted, the user can make changes to the proposed awardees. If the award is published again, suppliers will be notified accordingly. When creating event responses, suppliers will be notified with a popup window if 30 minutes have passed since changes were last saved. The popup will include an option to save changes. If a user has access to the Approve tab, the number of events awaiting the user’s approval will display upon login. The value will recalculate when new events are sent for approval or if the user rejects an event. Fixed an issue where events created from Purchase transactions had the line item bid List Price column set to supplier and entity visibility. The field will now default to an Included Status of Entity Only.